Howie DiBlasi, former CIO of the Durango Public School District in Colorado, presents at a conference on digital literacy. The question has guided the College of Education’s investment in Studio TEaCH, a dynamic collaboration and learning space for the use of educational technology. The question also informs the Studio staff’s recruitment of industry-leading experts to speak with Illinois State students. For the third straight semester, Studio TEaCH is hosting the T21 Speaker Series, which features interactive presentations that provide preservice teachers with access to professionals who possess proven track records in the use of educational technology. These valuable opportunities take place each Tuesday in the Studio’s cutting-edge space, located on the third floor of DeGarmo Hall, room 308. While registration is required, attendance is free, and refreshments are always served. Visit the speaker series site to see a full schedule and to register. March 18 will offer two can’t miss opportunities for education majors at 9 a.m. and noon hosted by Howie DiBlasi, the former chief information officer (CIO) for the Durango School District in Colorado. DiBlasi’s morning presentation is “The Digital Survival Kit,” and in the afternoon he will offer “Gators in the Sewers: Separating Fact from Fiction.” His first presentation is all about the ways educational technology can help teachers create positive classroom climates by differentiating instruction, engaging students in their own learning, and encouraging innovative thinking. In the afternoon, DiBlasi focuses on digital literacy. “Gators” refer to the information hazards that exist in every lurking corner of the digital universe. Attendees will learn new skills to critically evaluate and use information effectively and ethically, and to develop these skills in their future students. 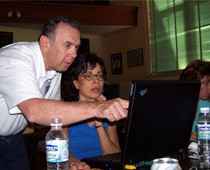 In Durango, DiBlasi facilitated his district’s professional development and created an innovative model that optimized teachers’ effectiveness with technology in the classroom. For the past six years, the “retired” educator—whose home base is now Austin, Texas—has traveled the nation to revitalize districts’ educational technology programs by advising them on the integration of 21st century tools into existing curriculum. Howie DiBlasi works with teachers and districts around the nation to drive effective integration of educational technology in schools. DiBlasi said attendees can expect a customized experience that is backed by ISTE standards, 21st century skills, and the common core. He places an emphasis on the value of creativity, critical thinking, and collaboration skills across every content area. “After the session, the preservice teachers will be much more confident in their ability to take an existing lesson and incorporate technology that engages their future students,” DiBlasi said. All students, alumni, faculty, staff, and friends of the college are welcome to register for DiBlasi’s and other sessions at the speaker series site. Past speaker series presentations are also available on YouTube. For more information on DiBlasi, visit his website and his new Disney-themed inquiry based project.